Below you will find our current selection of wrought iron side entry gates and also our popular metal security gates, all handmade by ourselves using premium materials and finished to a very high standard. All of our side gates can be fitted with a quality Locinox lock at an extra cost for additional security. All of our gates can be customised in any way so if you cannot find the exact size or style of gate that you require just ask! Sunrise Knotwood aluminium infill / steel frame side gate with locinox lock. Sherwood Knotwood aluminium infill, metal framed side gate. Our stunning Appleby modern metal side gate with lock. Clearance galvanised metal side gate with rings. 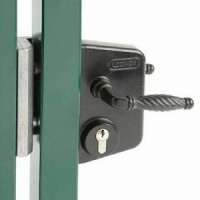 The locinox new generation gate lock.